We recently released The Decision Management Manifesto. In a post last week I explained why we did this. This week I want to talk about a couple of the key elements of the manifesto – its focus on putting Decisions first and its emphasis on Decision Modeling. We have helped many customers adopt business rules and analytics, and talked to many others. Over and over we hear about problems adopting these technologies and approaches. We see companies trying to manage a big bucket of rules and derive decisions from them. We see them building analytics that sit on the shelf because they don’t fit the actual decision-making going on. Without a real understanding of the decision involved these projects cost too much, take too long and have too little result. This experience led us to emphasize the importance of explicitly identifying decisions, mapping decisions to the rest of a business architecture, designing and modeling decisions before focusing on the specification or implementation details is critical. In fact you can think of your business as a sequence of decisions over time. Each decision, each choice, affects the trajectory of the business. Decisions are the primary way in which you have a impact on the success or failure of your business. Every decision should be linked to the objectives or performance metrics it affects so that the value of a decision can be measured in terms the business understands. Besides this focus on business results, organizations that manage decisions as peers to business processes make their processes simpler, smarter and more agile. They gain leverage because decisions are re-used between processes and because a focus on decisions makes a process more customer-centric and easier to personalize. 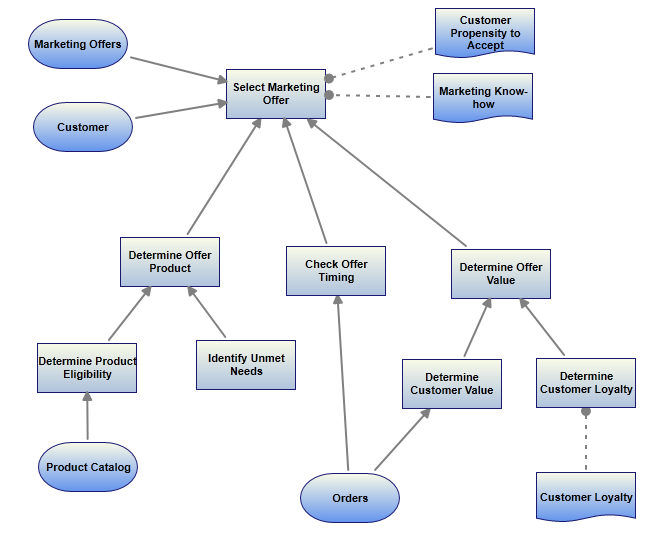 Like any component of a business architecture, decisions can be complex. Simply identifying them and giving them a name or description is not enough. Modeling and designing decision-making before plunging into implementation details makes sure that technologies and more lower-level design techniques are effectively applied. Question-first design works well in Decision Management. Think of it as a form of service interface-first design Describing a decision in terms of the question being asked and the possible allowed answers bounds it and makes it easy for other elements of the business architecture to design their integration with it. The new Decision Model and Notation standard is currently being finalized by the Object Management Group (Decision Management Solution is a submitter and DecisionsFirst Modeler, our modeling tool, already supports large parts of the standard). This lays out a model and a notation for designing decisions that can be applied using different approaches or methodologies. It allows skills and decision models to be reused and shared across projects and platforms. 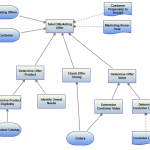 The notation supports high-level and detailed modeling of decisions along with their information and knowledge needs . Standards-based decision models structure and direct business rules projects, focus analytics on business results and build collaboration across business, IT and analytics teams. In the next blog post in this series about the manifesto I will talk about its technology recommendations. Meanwhile don’t forget you can always access the latest version of the Decision Management Manifesto at decisionmanagementsolutions.com/decision-management-manifesto and there’s an explanatory white paper too. And/or join me for the upcoming webinar; The Decision Management Manifesto Explained, Wednesday, November 20, 2013, 9:00 AM PT. If you want to get started using DecisionsFirst Modeler to build some decision models, check out the 60 free evaluation and sign up.